OK, this picture disappoints me because these just sorta look brown and dried out, but they weren't really. 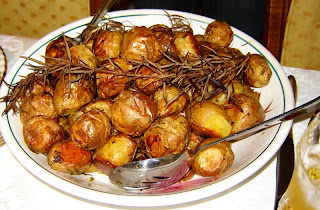 They were little Yukon Gold potatoes, roasted 'till golden with olive oil and big sprigs of rosemary from my backyard. Crisp on the outside, soft on the inside - heavenly! But the main reason these are special? They were the perfect place to try out the new Alder Smoked Sea Salt I got for Christmas. Oh my gosh, just a few flakes added an undertone of woody alder-smoke, almost as if I'd roasted these on the campfire! Sorry, no precise recipe, I just wanted to share, since they were so insanely, addictively good!! If you ever get a chance to try Smoked Salt, ...WOW! It's good stuff! And even if you don't have it, go make some roasted potatoes anyway. They're good on their own too! The recipe pamphlet included many nice recipes for fish, BBQ, eggs, hamburgers... Hmmm, I think I can get more creative than that! Mmm. My mom makes rosemary roasted potatoes, and it's one of my favorite dishes! I've never heard of smoked salt, but it sounds delicious. I think the potatoes look lovely.. You can tell how delicious they are.. rosemary pairs so well with tomatoes and the smoked sea salt and evoo.. holy moly.. takes it over the top. I've been into smoked sea salt too. it's really a great condiment. What a great Christmas present! I look forward to seeing what you'll do with it next. And your potatoes look delicious by the way. Wow, that smoked sea salt sounds amazing! I can't wait to see what other tasty uses you have for it. ooOoo, smoked salt. love it! i think the picture looks pretty darn good myself. I've never heard of smoked salt. Sounds fantastic. I've gotta find some. Roasted veggies are oh so good. I've never thought of trying a different salt - what a great idea! Ironic timing, I was visiting Saltworks site last week perusing all of the unique salts and wondering if they were worth trying. Guess I'll have to take the plunge! Oh I would love to get my hands on some of that smoked salt. It sound fabulous! And with roast potatoes?! Who needs meat? Its me Chef Joey from recipezaar. You left me a comment on a sub. for sweet ricotta cheese. Thanks for your offering, I appreciate it a lot. I'm dairy free and trying to be carb free so any subs. are most appreciated. You just amaze me, I have never left feedback on anyone's blogs before. I have to say you submit the most AWESOME recipes and seem to just be "right on the money" for exactly what I am hungry for when I religiously check your blog every night. Thank you for sharing these delicious recipes and sharing your life. I have only been a vegan for a short time, but thanks to you and maybe because you and I are both southerners, I can easily transition to wonderful delicious vegan recipes and never feel deprived! !